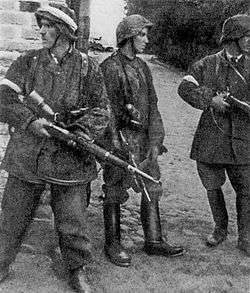 Captain "Mruk" of the Radom-Kielce area Home Army, with a Soviet reconnaissance patrol. 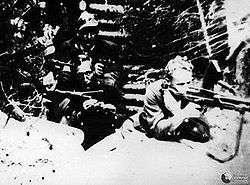 Polish Home Army's 7th Infantry Division, from the Radom-Kielce area, during Operation Tempest. Operation Tempest in Polesie took place in final days of German occupation of this region. Due to rapid Soviet advance westwards (see Operation Bagration), it lasted for two weeks (July 15–30, 1944), mainly in the western part of Polesie, near Brzesc nad Bugiem, Kobryn and Bereza Kartuska, but also in the area of Pinsk. The Home Army headquarters gave orders for the 30th Home Army Infantry Division to be created in Polesie. This unit was tasked with capturing the areas north and east of Brzesc. 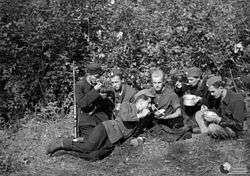 The division concentrated in forested areas along the Nurzec river, with some 1000 soldiers. On August 14, 1944, General Tadeusz Bór-Komorowski ordered all units of the Kielce - Radom area to march towards Warsaw, and join Warsaw Uprising. Operation Revenge, as it was called, resulted in creation of Kielce Corps of the Home Army, under Colonel Jan Zientarski, with 6,430 soldiers. On August 21, during its concentration, the Corps saved residents of the village of Antoniow, which was raided by Germans. Even though Kielce Corps began its march towards Warsaw, it did not reach Polish capital. After careful analysys of German forces concentrated around Warsaw, Home Army leaders decided to halt the operation, as it was too risky. Poles did not have heavy weapons and tanks to face the enemy on equal terms. Operation Revenge was abandoned, and the Corps was dissolved. 1st company of Sambor command of Drohobycz Armia Krajowa inspectorate during Operation Tempest. ↑ Włodzimierz Borodziej, Barbara Harshav (transl. ), The Warsaw uprising of 1944. University of Wisconsin Press, 2006.